"About the dangers out there." Nubern leaned in to the camera. "There is much more going on in Quadrant Eight than I have been at liberty to tell you." Austin Stone always heard you can't go home again, but he is looking forward to his leave on Earth. Upon his arrival Austin is immediately thrust into danger as a shadowy force targets Star Runners and their loved ones on Earth in a series of violent attacks. After surviving an explosion on the streets of San Francisco, Austin rushes back to Georgia to secure the safety of his mother. Violence builds, and an unimaginable attack is launched, leading Austin back into the seat of a Trident fighter to defend his home and family. far exceeded my expectation. Once i started, it was hard to stop. I can't wAit for the next book to arrive. When you read a story like this, you want to be able to lose yourself in it, it is about escapism. Unfortunately, there are some issues that make it difficult to suspend belief and really get into the experience. This includes things like a starship going from space to the atmosphere to underwater. Now space to atmo is fine for the most part, it requires some changes or allowances to the craft. But underwater requires some significant changes as just because it can go in Zero-G, with no air, doesn't mean it can survive underwater, or more to the point, that its engines work underwater. And in the event that they do, there are significant differences in detection techniques underwater than in space, as well as the weaponry used. Non of this was taken into consideration at the start of the book, in which our main character just fights off pirates in space, then straight under the water, with no changes to his Trident (appropriate name for under the water though!) The really annoying thing was that later in the book, it is brought up that their ships need to be altered for use under water in a later fight, after the initial fight has already occurred without modifications?? There are multiple little (and some bigger) things like this throughout the book that take away from it, making it difficult to read, and ruining its fun, destroying the escapism. There was also a lot of what I would call 'Teenage Soap Opera Dialogue' as well in this book between the characters that detracted again from the story. 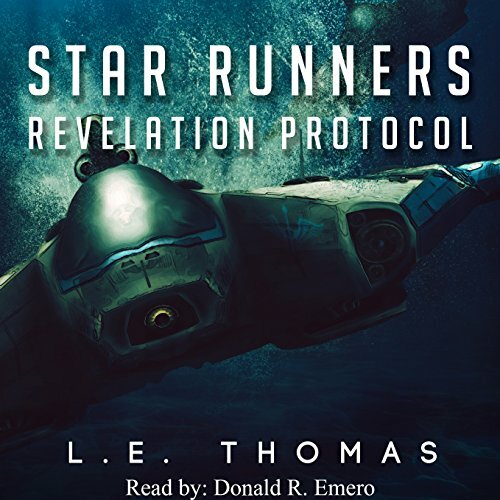 Has Star Runners: Revelation Protocol (#2) turned you off from other books in this genre? I will probably give part 3 a go, simply because I'm a bit OCD when it comes to books and like to finish the series off. The Narration was one of the really good things about this book, they did a great job. They had a great voice, and used it to generate an interesting and comprehensive set of Character voices for both Male and Female characters. What character would you cut from Star Runners: Revelation Protocol (#2)? Mr. Emero's character performance was good; however, his reading of normal text seemed stunted and amateurish, at times. Some more work on the basic narration is needed. The continuing story was very good. Enjoy! If you could sum up Star Runners: Revelation Protocol (#2) in three words, what would they be? Needs more romance with Scorpion. This story was set from point of view of two of the series characters. In listening to it I found it confusing when the POV changed and it interrupted the flow. It might not have been so discordant if I had been reading the book instead of listening to it. However, the the plot itself was good.